Since Valentine's Day is coming up, the chocolate is flowing. Perfect excuse to indulge, whether or not you are doing so in the name of love. And who can resist that antioxidant-rich, totally amazing smelling, rich and creamy stuff we casually call c-h-o-c-o-l-a-t-e.
Just turn your head and it will surely seduce your taste buds. 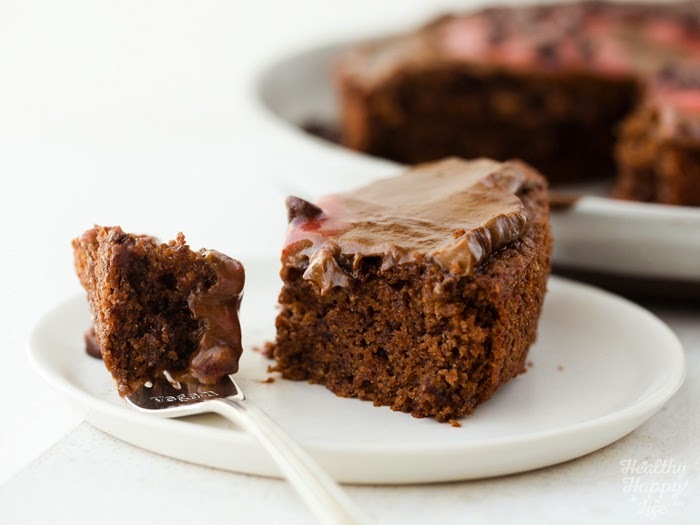 Melty chocolate drizzled over top berries, shiny melted chips beaming from inside of cookies, deep dark ripples of chocolate mousse or simply a giant platter of the stuff looking all devious and sinful as a fluffy double chocolate cake. Like this one. My Vegan Chocolate Cake with Avocado Frosting. 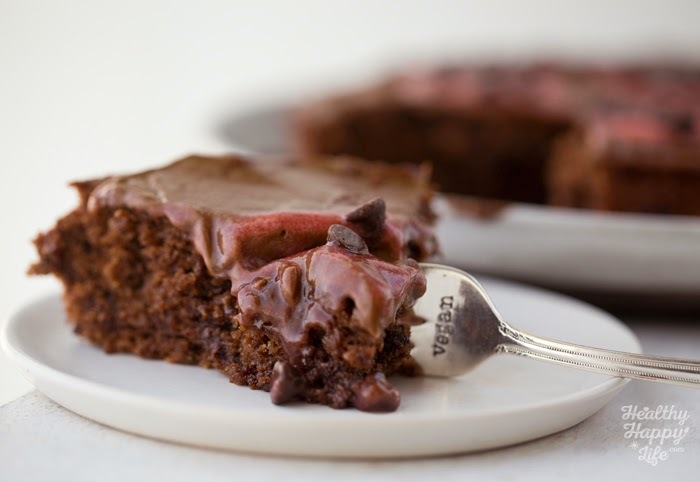 Vegan dessert for Valentine's Day!.. Chocolate is everywhere this week. And for good reason. It is undeniably romantic. But instead of a clichè box of store-bought chocolate this year, whip out the kitchen apron and make your Valentine a dessert she or he will not soon forget. 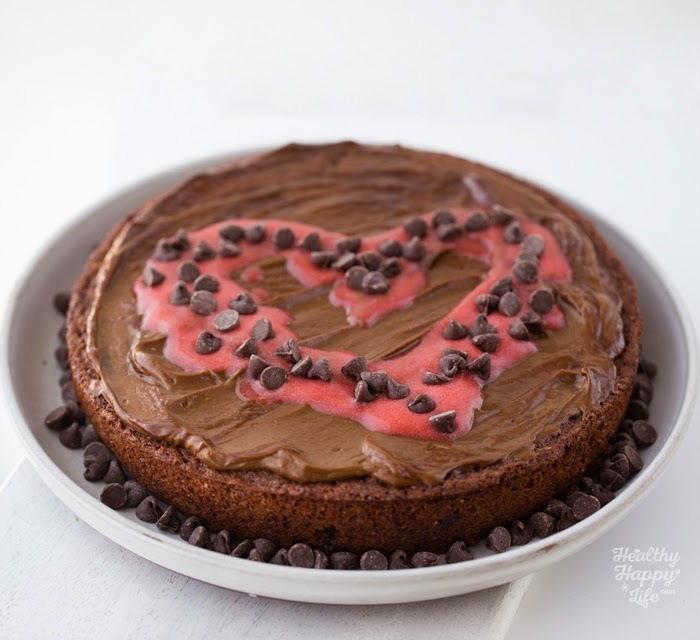 This cake is super delicious with its creamy layers of chocolate and perky strawberry heart on top. And beyond that one silly day a year, February 14th, this cake can be made for pretty much any special or ordinary day. Make it for yourself, a friend, another special event or a boring old weekday. 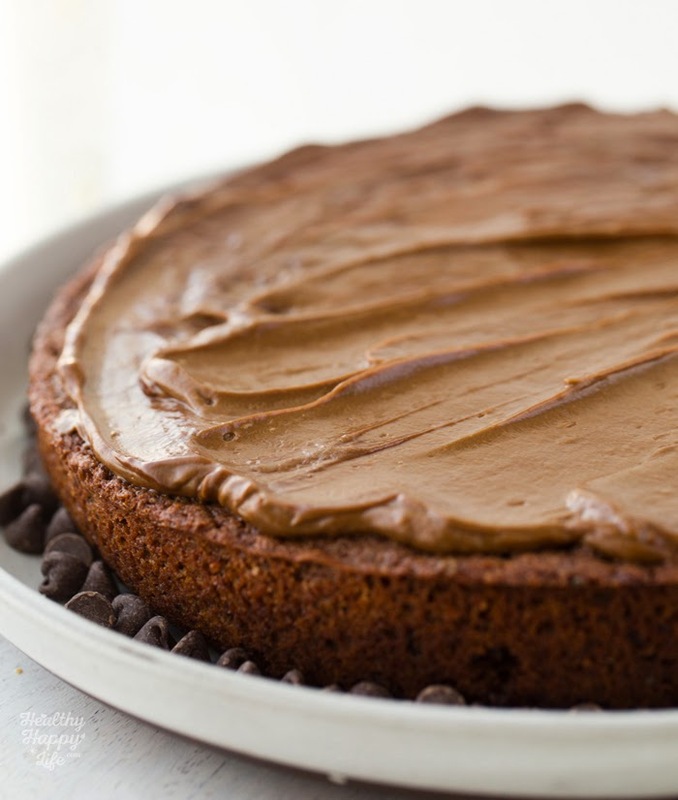 This cake will bring some love to any day at all. Want a Valentine's Day gift that starts giving NOW and keeps giving all year long? Pre-order my book Healthy Happy Vegan Kitchen and you or your Valentine can receive some AMAZING bonuses right away, like my 50-page wellness guide and meal plan with loads of color photos, recipes and tips, and my bonus cookbook recipes, entry into an exclusive giveaway and more. Details here. Give the gift of healthy happy meals and wellness! Share a Slice. 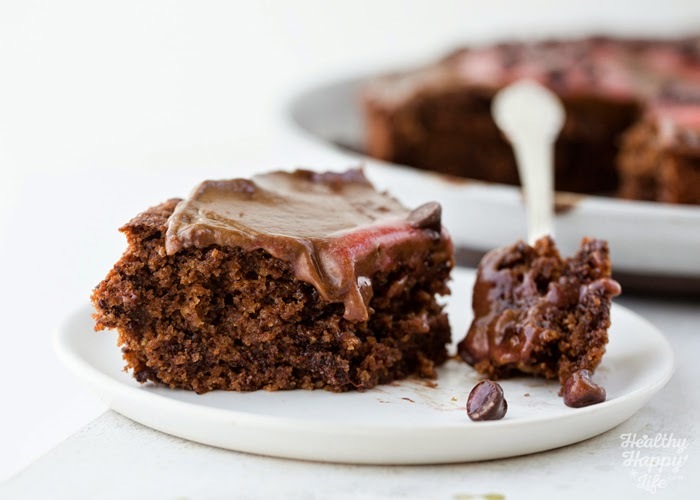 This rich and fluffy chocolate cake is swirled with a ripple of chocolate fudge and covered in a thin, yet decadent layer of avocado chocolate frosting. An optional, and super sweet, pink strawberry heart on top. Perfect for Valentine's Day! Fun Fact! 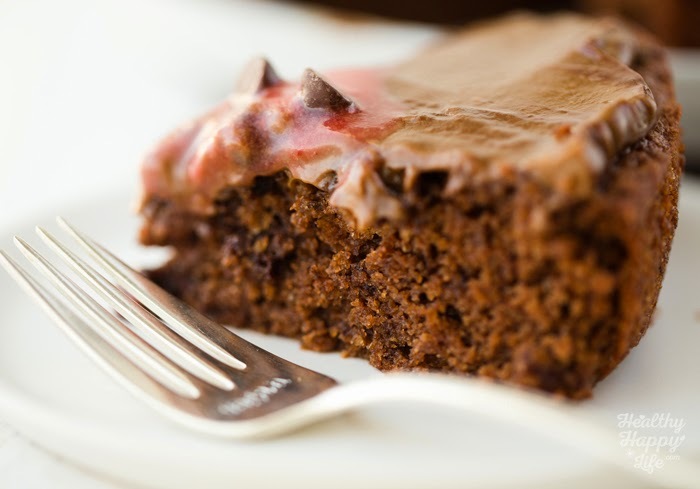 This frosting also doubles as a yummy chocolate pudding or mousse! 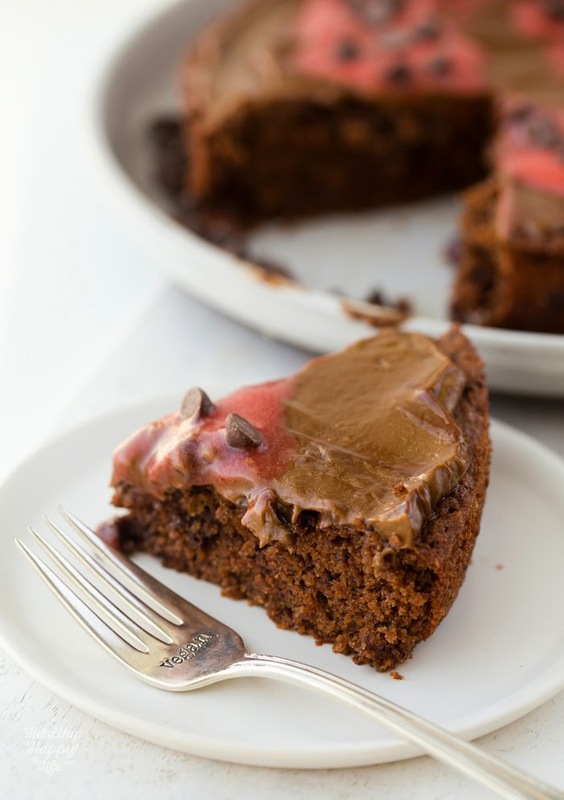 This rich and fluffy chocolate cake is swirled with a ripple of chocolate fudge and slathered in a thin, yet decadent layer of avocado chocolate frosting. An optional strawberry heart on top. Preheat oven to 350 degrees and grease a 9 or 10 inch round cake pan with a generous amount of coconut oil or vegan butter. Combine all dry ingredients in a large mixing bowl and set aside. Combine the 1/2 cup of vegan butter and 1/2 cup of vegan chocolate chips in a small bowl. Then pour in the HOT coffee. The coffee needs to be hot so that it melts the vegan butter and lightly melts the chips. Stir briskly for about 2-3 minutes, until a thick and melted mixture forms. Fold the melted chocolate mixture into the dry bowl and add the remaining wet ingredients as well. Stir well. If desired, beat with a hand mixer for 1 minute, but this is optional. 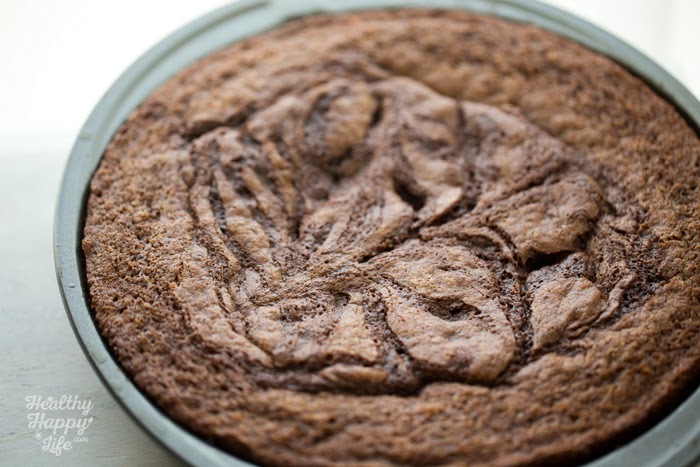 Pour the batter into the cake pan and set aside while you melt the swirl chocolate mixture. For the swirl: heat the chips and vegan butter in a mug for 30 seconds and stir briskly until melted. Drizzle this in a swirl over top the cake batter. 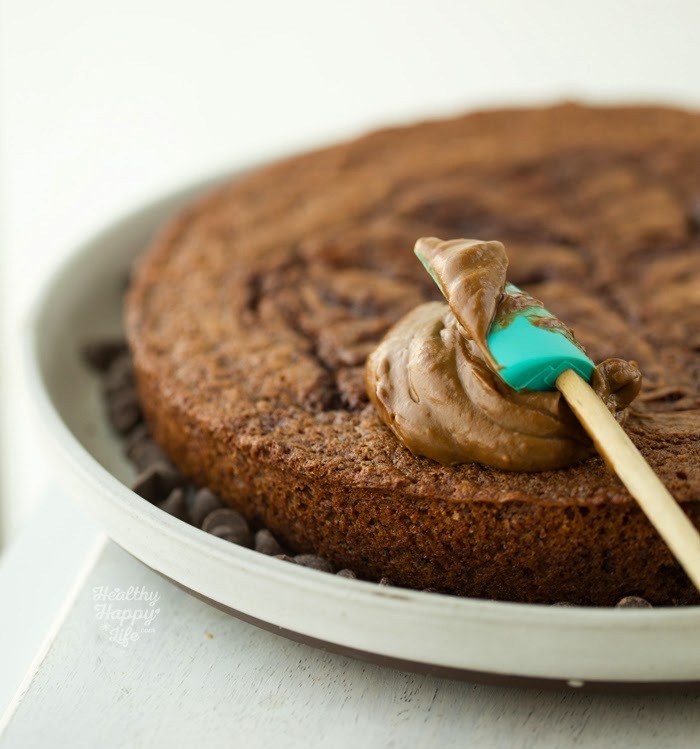 This swirl will add chocolatey richness and also help to weigh down the cake center so that it stays rich and dense rather than too fluffy on top. You can watch in the oven as the cake rises how the chocolate weighs it down slightly - in a good way. Add the cake to the 350 degree oven and bake for 25-30 minutes or until a toothpick test comes out clean. Pull cake from oven and set aside to cool for at least 20 minutes before attempting to remove from pan. 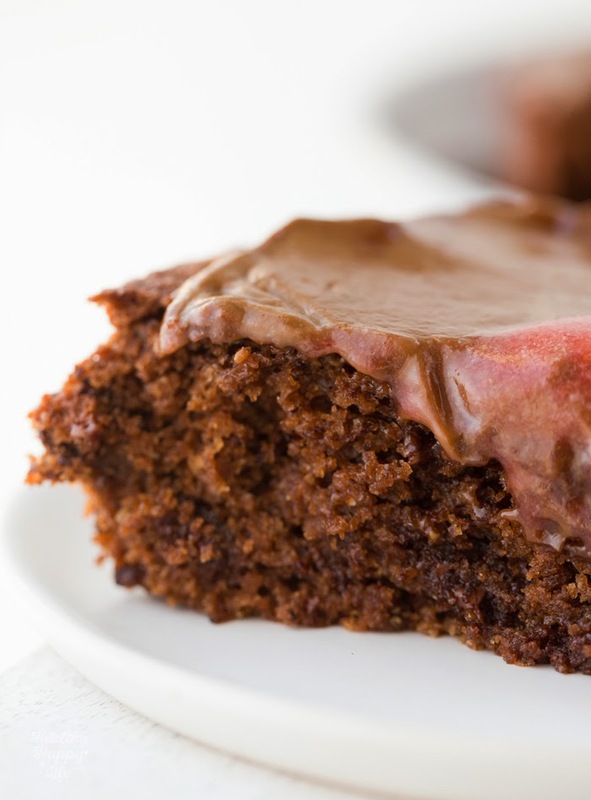 When you remove the cake from the pan, transfer it to a cooling rack or to your serving plate. For faster cooling: place the cake in the freezer for 10-15 minutes. 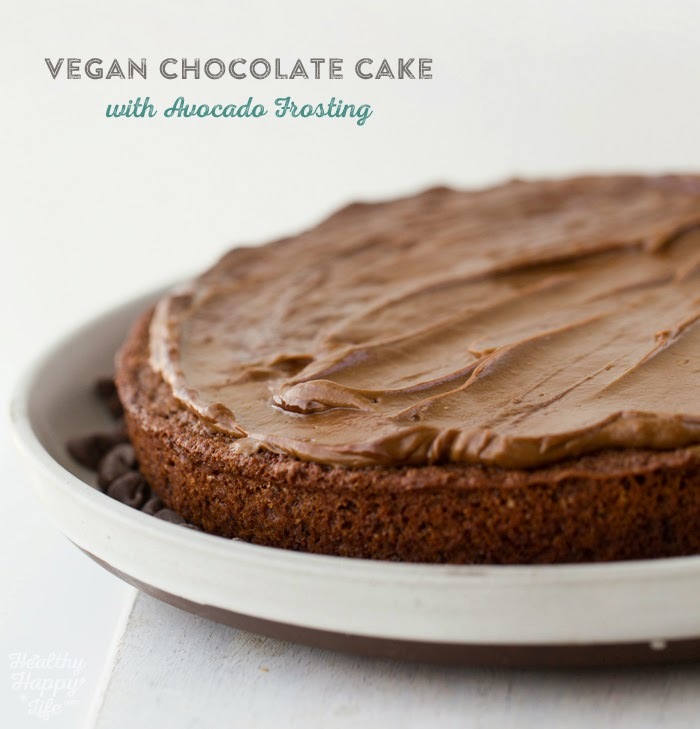 Frosting: Add the avocado flesh and melted oil, vegan butter and chocolate to a blender. Blend until smooth and fluffy, about 1 minute or so. A small or narrow-sized blender container works best. When cake is warm (mostly cooled) you can spread the frosting on top in a thin yet buttery-rich layer. 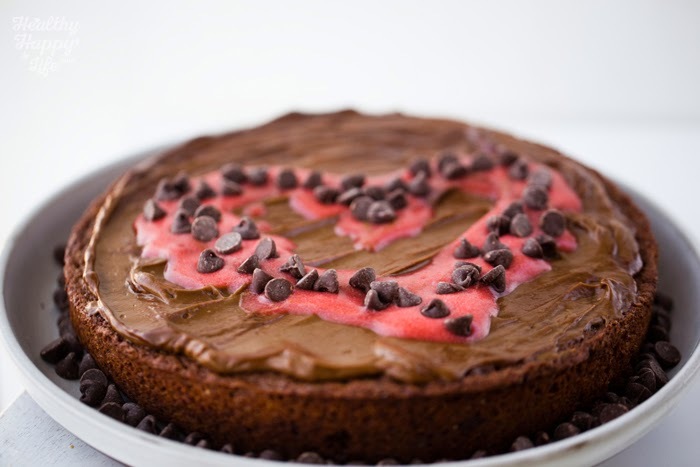 Optional strawberry heart: blend the berries, sugar and oil until smooth and velvety, pour into a cup and place mixture in the freezer for at least ten minutes before swirling - this will thicken the mixture -- then swirl a heart on top of the cake -- add optional additional chocolate chips. Serve right away or store in the fridge until ready to serve. Cake stays delicious for up to 4-5 days when covered. 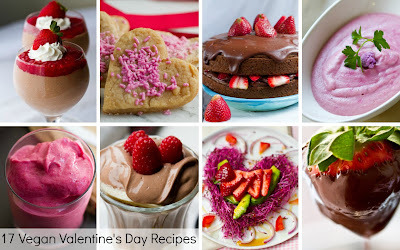 Want more Valentine's Day recipes? I shared my 17 favorites with Parade's community Table.